In the PDA market, size tends to be everything. You want a small device, but not to small, and you don?t want it to be so small that you lose the features you need. 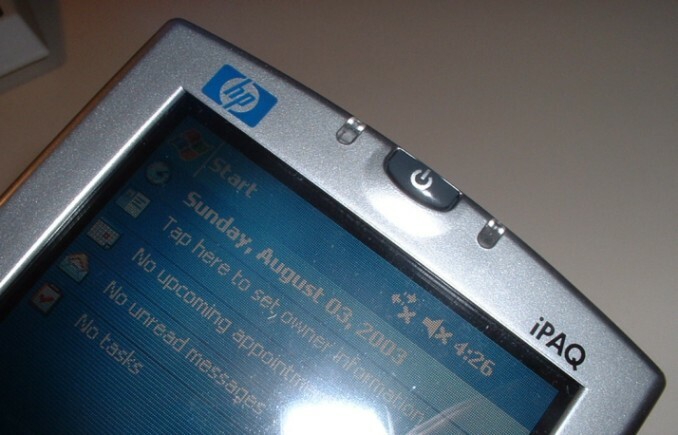 Deciding when size, productivity, and features are all just right takes quite a bit of work, and the HP iPAQ H4350 is another attempt at doing this?only with this device, they may have hit the nail on the head. 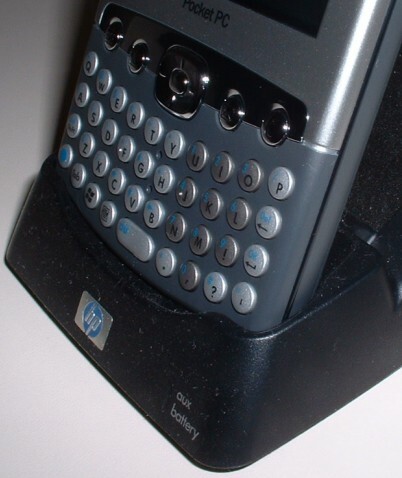 Taking over for the iPAQ 5000 series devices, the H4350 is HP?s newest flagship of the iPAQ line, but is it the best or an overpriced, all features device? Powered by an Intel XScale PXA255 processor running at 400Mhz and Windows Mobile 2003, the H4350 includes 64MB of RAM and a 32MB ROM (about two megabytes are available for permanent storage). Both 802.11b (WiFi) and Bluetooth are both embedded in the device with a standard IrDA port. For expandability, the H4350 has an SDIO expansion slot, and for audio output, a standard 1/8? jack is included. The device recharges and syncs through the same port on the bottom of the device, and includes a removable, rechargeable 1650mAh lithium battery. The H4350 was released at the same time as its sisters device, the H4150. Both include the same internal specifications (except battery power), but the H4350 has a different style because of its included thumb keyboard. 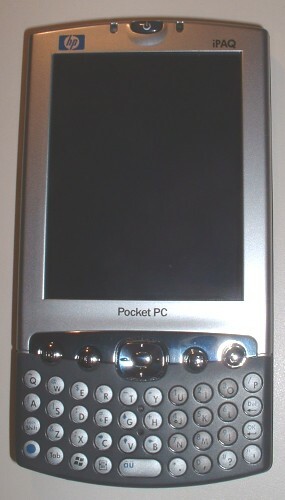 The H4350 has a similar style to other iPAQ devices with its silver and metallic front. The device has two LED?s, one for showing if WiFi and Bluetooth are active, and another for power and alerts. The buttons are in a similar style as the H4150, except that below them is a thumb keyboard which has blue lights behind it for use in dark locations. At just over a half an inch thick, the H4350 is of excellent thickness. (You probably couldn't pack anymore into this device.) Its sister device, the H4150, is compact in all ways but the H4350 is longer and slightly wider because of the additional keyboard. The unique thing about this device is obvious when you look at it. While many Pocket PC?s support a snap-on thumb keyboard, the H4350 has it built in. Having it built in reduces the bulk incurred by an additional keyboard, but for users that don?t need or want a keyboard?well then there is extra size. When I first took the 4350 out of the box I was excited for the thumb keyboard, but then as I began carrying it with me I was not as sure if it would be a good thing. It wasn?t until I began actively using the H4350 as my primary Pocket PC that I found why the thumb board is great. 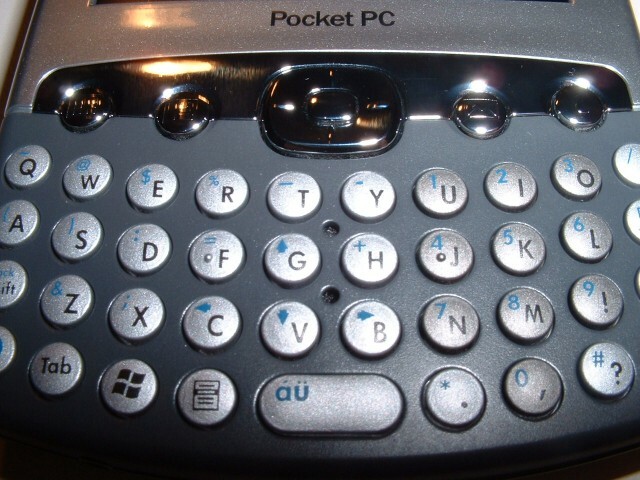 I use the H4350 more than I have used any other Pocket PC simply because of this input method. Ok, there are some other reasons, but seriously the thumb board is a great addition. I have big hands so I can?t use it like a normal keyboard, but you would be surprised at how fast you can get just using two fingers or thumbs. Internet Explorer use benefits the most from the thumb board. Internet addresses are easier to get inputted and filling in forms is a breeze. I think it is my Smartphone which has trained me to not use a stylus (plus I have bad handwriting) so for me, the thumb board is now going to be one of my must haves. The H4350 only has an SDIO expansions slot, but it does not really need anymore than that. Personally, I would have been happy with just an SD slot because the iPAQ has two types of wireless embedded and unless you want to add a camera, you only need SD (not SDIO). Both 802.11b WiFi and Bluetooth are embedded in the device, saving the user hundreds on expansion cards and allowing for local and network connection simultaneous. HP has included a small, simple, four button application to turn on and off each type of wireless individually or together. I wish it were easy on other devices where the wireless is not embedded to turn them on and off without removing them. When Microsoft talks about zero configuration wireless, the H4350 exemplifies that. If the WiFi is on, just come into range of an access point and the device configures and connects. Not only that, but it stores access point information so you can connect easily the next time you are in range. Running both wireless options can be taxing on the battery, but I have found that running one, while is does take away some life, is not that detrimental. If you turn it off before turning off your device, then you won?t try and connect next time if you don?t need to. 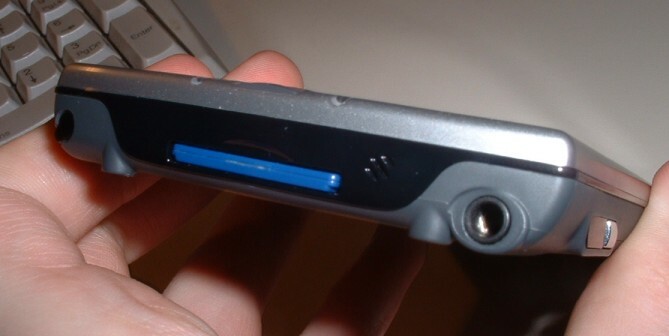 A standard IrDA port is included, though is on the side of the device. I always prefer it on the top because while it aligns fine with my laptop, others it leaves your device upside-down. Like most Pocket PC?s, the H4350 includes seven buttons, four quick starts, record, power, and action. The power button on the 4350 is my favorite of any other device. Large, easy to press, and still holds up for keeping the device off when you don?t explicitly press the button. The record button however is a different story. 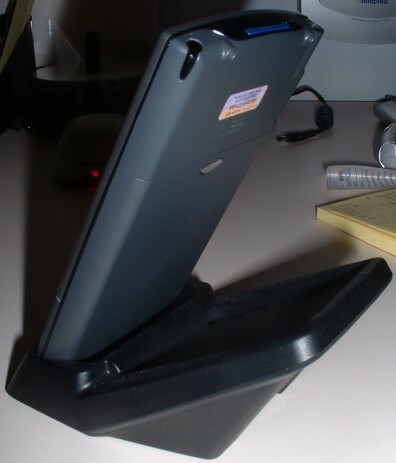 It is placed on the left side of the device, adjacent to the infrared port, but if you use the included iPAQ case (which isn?t my prime choice for a case), you often press it when pulling the device out of the case. While the four quick start buttons on the front of the device are easy to press, the action button, which is set in the middle of the directional pad, is more difficult. The problem is you often press part of the directional pad too because of the d-pad?s side. It could just be the d-pad is relatively small. I find it hard to use for general navigation. The battery on the H4350 is more powerful than the H4150 by 50%. While having all wireless options turned on will deplete the battery quickly, but if you do not use all the wireless and expansion options at once you can get upwards of four hours of use. I get conflicting reports when I ask about the cradle for the H4350. Some think it is fine, some like my Axim X5 cradle much better, but I love it. First reason, no cables. Unlike most cradles now with attached cables, the iPAQ cradle just has jacks for power and USB. This is great because I only like having one power adapter for multiple devices, so I can easily switch in between the cradles of the difference devices. Second, no USB cable. Ok, so that is the same as the first, but I figured out why this is important when you have a device like the H4350 with Bluetooth. You don?t need USB if you have a Bluetooth enabled machine, just sync with Bluetooth. 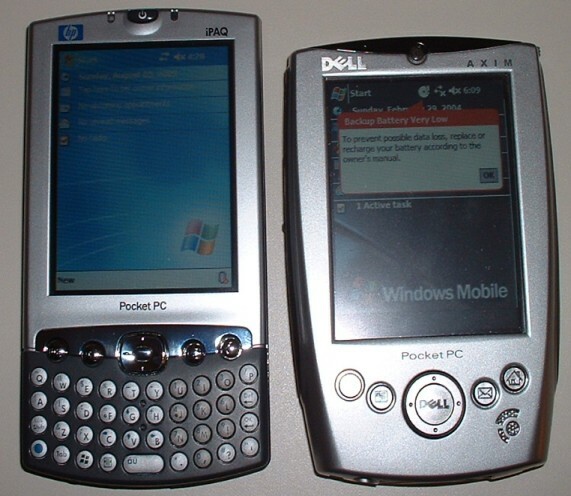 You can actually set Pocket PC to connect via Bluetooth when the device is placed in the cradle. Now I can have my Pocket PC charge and sync by my bed instead of with my computer. Finally, I just like the design of the cradle. It is simple but nice looking, and can charge an additional battery while charging the device. Can I trade? I realize I said that in my last iPAQ review, but this is it, I won?t say ?can I trade? again for another?week?at least. But seriously, I think this is the device I like most out of what is currently available. After using it, I find it has the features actually will help me be a better user of my device and increase my productivity. The size is alright for me and is a trade off for the keyboard, which I use almost every time I pull out my device. Embedded wireless is key, and having both Bluetooth and WiFi has been great. At $500 the iPAQ H4350 is more expensive than most devices on the market, but if you need the features this device has, it is well worth it. Just pick up a new case and memory card with this device and you are set for doing just about anything.